Ahh man, Wishing I had hit this road now. Looks amazing. Congrats on the engagement too! Ahh, we went to Deia and it was incredible. Make sure you get down to Cala de Deia. We stayed over in the middle of the island near Inca and it served as a nice base of operations for us. Enjoy! Didn’t hit this road, but the little V40 Cross Country rental I had when I was in Mallorca last year was a blast on these curvy little roads. And the views were amazing as well. Enjoy! Oh yeah, we get a lot of London commuters. Those are cool and all... But that crew cab F-series in the first picture!! I should also point out, that while expensive for a consumer setup, you are getting a lot of bang for your buck. Nothing in the market comes close to Ubiquiti’s price point for what they are providing. You also can forgo the Cloud key and run the controller on...well really any computer. What’s your budget. A really solid option on the market at the moment is from Ubiquiti. You have to get a few pieces of gear instead of an all-in-one but it is rock solid and easy to use. You also get pretty graphs! I’ve watched a lot of their stuff online. It really seems like something more suited to a video considering the style and band changes between each song. I’ve noticed a whole slew of different musicians in the videos too so I’m sure it’s always different when they are live. Ooh, an old Crown Snorkel. Fantastic vintage fire truck. Wow... That’s amazing. I would love to have that. I will make one of these eventually! That might be fun. I would need a lift out. Hey, small world! I live in Brighton. 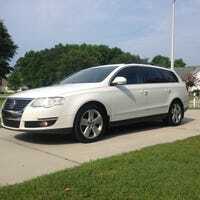 Had one on my B6 wagon. It came with the car though. I was going to wire up a rear fog but ended up selling it to move. Love the truck. When I get back to the states something like that is high on my list as a second vehicle.